Lately we’ve been making meals where almost every ingredient has come out of our garden, and it’s incredibly satisfying. With the cooler weather, we’ve been able to turn on our oven and stovetop again, saving us from daunting tasks like eating 20 gorgeous heirloom tomatoes raw before they start to mold (a 3 day window) and finding ways to use up pumpkin without the help of a long, slow, caramelizing roast. The first meal where nearly everything was homegrown was a Mediterranean Shepherd’s Pie – we had grown the garlic, the onion, the tomatoes, the eggplant, the zucchini, and the potatoes. Really the only ingredients that we hadn’t grown or made were the cheese and the ground beef. 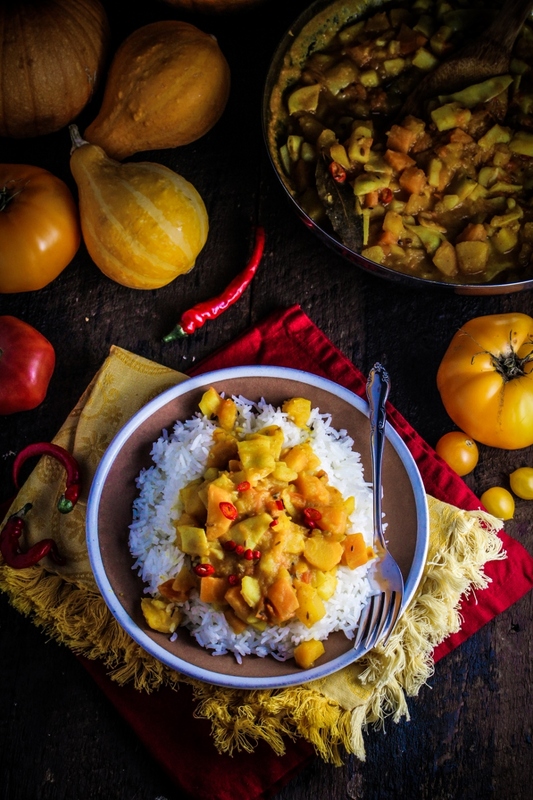 And now, we have this gorgeous yellow curry, packed full of vegetables taken straight from the ground – we even grew the cayenne chilies that give it its kick! 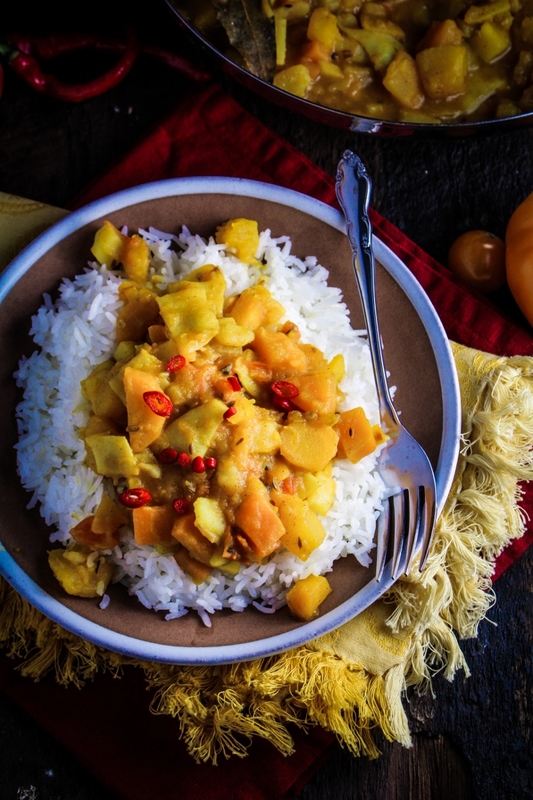 This yellow curry is relatively quick, easy, and deeply nourishing. It’s made from only vegetables, spices, and water, and I was skeptical about how much flavor I’d be able to coax out of such a limited number of ingredients. No rich and creamy coconut milk? No savory chunks of lamb? 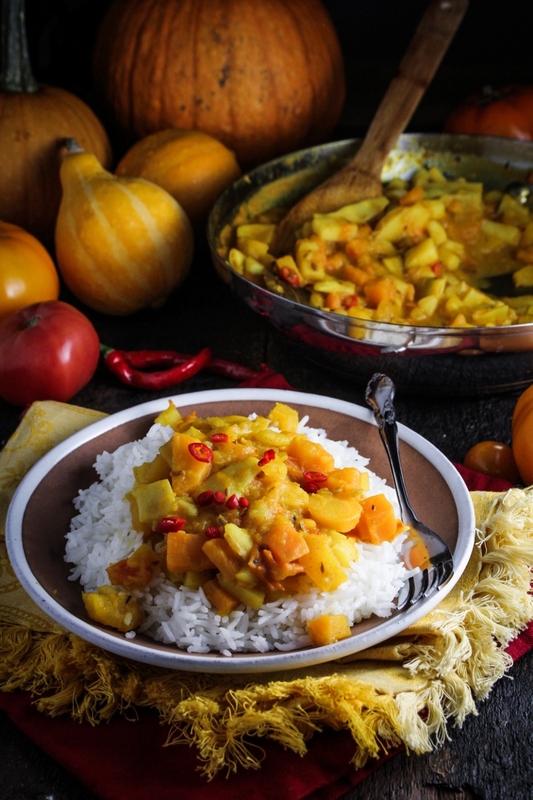 But the carrot and pumpkin deliver sweetness, the tomatoes acidity, and the potatoes break down into a thick, rich sauce that soaks up all the flavor of the toasted spices. It’s a lovely curry. Of course, I can’t take much credit for it, beyond, perhaps, the addition of the tomatoes, as it’s adapted from Mangoes and Curry Leaves, my Indian cooking bible. 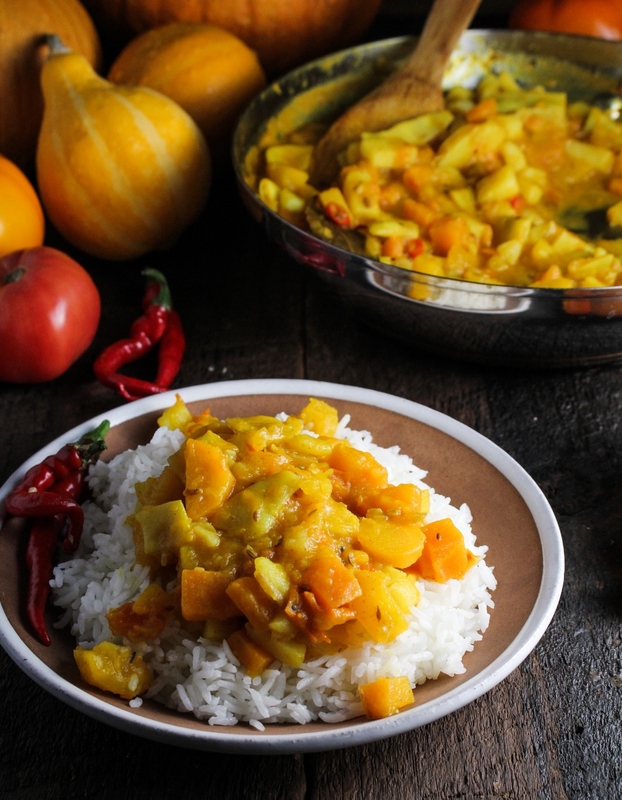 I love Indian food and have been attempting it at home since I first started cooking, but it wasn’t until I took a step back and took time to learn the fundamentals that I started to turn out satisfying Indian dishes. Now my repertoire is slowly building – I love these potato and pea parathas and this chickea pulao, and now I can add this adaptable vegetarian curry to the list as well. Adapted from Mangoes and Curry Leaves. Serves 4. Heat the vegetable oil in a wok or large frying pan over medium-high heat. Add all of the spices and bay leaves at once, and stir-fry in the hot oil until the mustard seeds start to pop and sizzle. Add the vegetables in order listed, stir-frying for 1-2 minutes between each addition. If the vegetables begin to stick to the pan as you are cooking, add a few tablespoons of water to the bottom to deglaze any sticky parts of the pan. Add the fresh cayenne chile and cook for 1-2 minutes longer. Once you have added all the vegetables, pour the water into the pan and bring to a rapid simmer. Simmer until all vegetables are tender, potatoes and tomato have broken down, and the sauce is thick and spoonable. This should take about 15 minutes-20 minutes. Add the salt, sugar, and lime juice and taste for seasoning, adjusting as necessary. Remove from the heat and serve over rice. Isn’t eating out of your yard just the best?!! This looks like a wonderful dish to transition into fall.